When we moved to England in 1992, we quickly realized that the British Islands are very distinct in terms of their nature. Nowhere else we have seen before trees full of blossoms in early January. At least till today I was convinced that this must have to do with the rather mild winter in the southern counties of the UK, like Kent, Sussex or Surrey, where we lived. Today I found the exact same tree on a cemetry in Munich, and became interested in its history and how it became so resistant to cold weather. 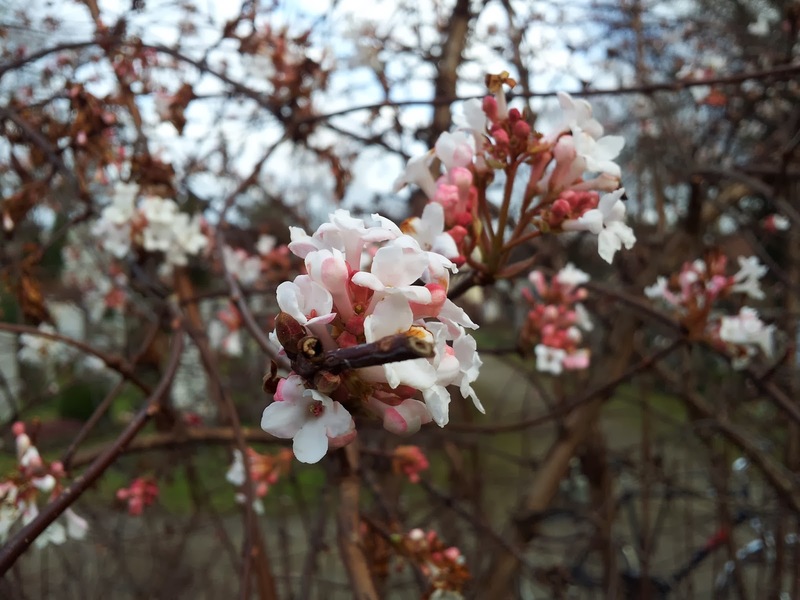 The name of this tree is Bodnant viburnum (Duft-Schneeball in German), and it is actually a product of man made plant breeding. The cross of Viburnum farreri (formerly V. fragrans) and V. grandiflorum was originally made by Charles Lamont, the Assistant Curator at the Royal Botanic Garden, Edinburgh in 1933, and I guess this is the reason why it became first popular in gardens and parks in Brittan, and only later was imported to other European countries. So this tree is unique for showing its real beauty only in winter time, when (at least in Germany) most other plants lost their leaves and look pretty sad. I don’t really know why all around the world people warship so much the Christmas tree. I think they are pretty boring, and except for their wood have no use at all. Their needles are a pest once you have them on your carpet, and if you have them in your garden, they poison all other plants (by producing humic acid). Their roots destroy the foundations of buildings, inhibit the growth of grass and promote growth of moss. If you have some spruce or fir in your garden, you can be sure that after a while the garden looks like a dark forest. we have three of them in our garden, and I plan to cut them all this year to heat our oven with their wood. But even for heating, they are no good choice, since their resin causes a lot of soot which contaminates the chimney. 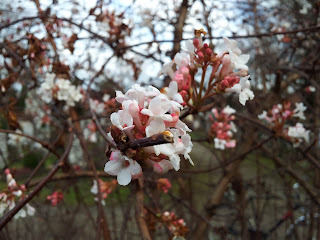 I would therefore opt to replace the fir (christmas tree) as symbol of life in hard winter times with Bodnant viburnum. It is an elegant and beautiful three, and it permits the few rays of winter sun to reach us, whereas pines and firs are like black spots which block the sun. By the way, there are other plant species which resist the winter cold. 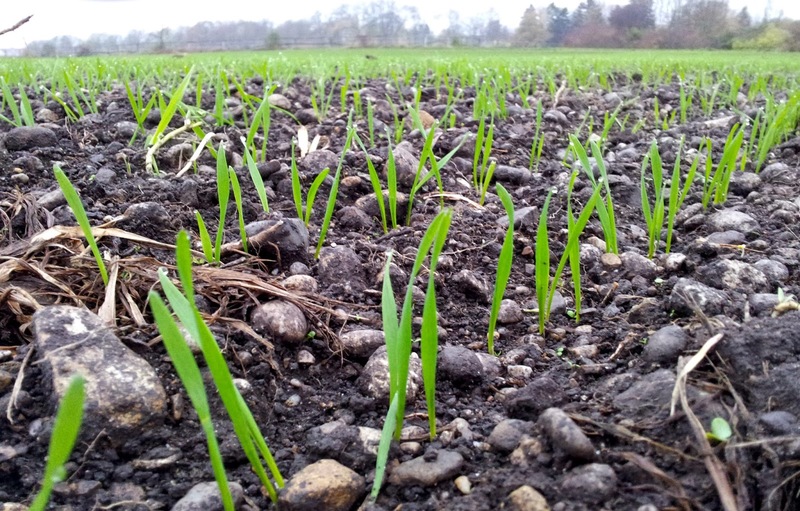 I also like a lot the winter-hard cereals like rhy or barley, which look freshly green even at the strongest frost. 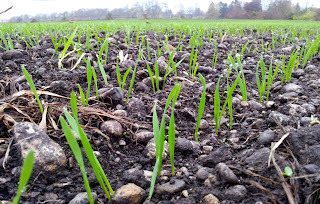 When I saw these tiny young shouts now in December, I was happy to know that next year we will have again fields full of golden rhy with its tentalizing odor in summer. hi michael, evolutionary reasoning would suggest that if the tree is blossoming in december, it has a certain chance to be pollinated. And the nice redish blossoms suggest that it tries to attract insects. I am wondering which insects around in the midst of winter time ? Dear Ghazal, your line of evidence sounds to me like in marketing research: If a shop continues to offer a particular product at a particular place, there must be customers (even if we don’t notice them). Then you think the Bodnant viburnum tree is only there to look for a succesful “deal” ? And I thought it presents its blossoms only to please us, and to bring some nice colours to these grey December days. How could you destroy my illusion so cruely ?! Now I begin to understand what you tried to explain me some time ago about DATING, and how important it is to present yourself in the best possible way for the potential candidates. But I bet the game follows different rules in summer time, right? you mean summertime, when the living is easy ? but the insects always worrie me, as you know. they might facilitate pollination, but they can be a nightmare at a summer evening :-/. do you know if this tree that blossoms in winter time also grows here in sweden ? i’d like to plant one behind our house, so in the absence of snow it would give the imagination of a snow-ball.